There has been some damage done to the path over the winter by fallen trees and flooding from a blocked culvert but this has all been put to right. There will be regular work parties during the next few weeks bracken pulling and planting native species of flowers and shrubs. We only use approved stock to comply with our biodiversity grant and are not supposed to plant non native species, although some have been appearing along the way. Anyone wishing to join us on these work parties would be very welcome. The Cub Scouts will be helping us to build bumblebee nests and we are also having some bird boxes and squirrel feeders made. The wetland has a healthy population of frog spawn, young newts and insect life. The CMFA was set up by a group of volunteers from the community in response to issues raised at a Comrie Community Council meeting. One issue raised was that there were no paths away from traffic into the green space suitable for all abilities, including wheelchair users, the less able walker and families with prams and toddlers. At a public meeting a chairman and management committee were appointed and the CMFA was set up. Feasibility, topographical, and biographical studies of several routes were carried out. The path along the River Lednock was identified and became known as the Lednock Millennium Footpath (LMF). 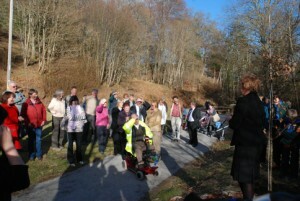 On 25th March 2011 the CMFA were delighted to declare their long awaited footpath open. The opening ceremony was performed by Roseanna Cunningham SMP. She also planted a tree with the assistance of the local cub scouts. The tree is a sessile oak which is native to this part of Scotland. The path is suitable for all walkers and is already being used by walkers in wheelchairs and people with small chidren in buggies. The storyteller’s chair is in memory of the sister of one of the directors of the CMFA and shows it being used by her two younger sisters and also by the cub scouts.The cubs have also helped with planting native wild flowers and shrubs in the meadow. Welcome, to our village website. We hope you enjoy finding out more about our vibrant community ! I consent to Comrie collecting my details through this form.